Matrix® AP Harmonic Filters provided the optimum solution for reciprocating pump operators in the Bakken oil fields. Oil reciprocating pumps rely on a large counterweight to offset the weight of the pump rod which can be several hundred feet long. This produces a motor and drive load profile that is cyclical with a frequency from 2 to 5 cycles per minute. During one of these cycles, the load can vary from 0% to 100% or more for short bursts, with an average load of about 40% to 60% during the loaded portion of the cycle. In the oil fields, these reciprocating pumps are the main load on the power grid and sometimes can be the only load for many square miles. The cumulative effect of perhaps hundreds of these types of loads on the power grid results in higher background harmonic voltage distortion for the entire grid in that region. Conventional harmonic filters are designed to perform between 80% and 100% load. In the oil fields, the cumulative effect of lightly loaded drives and filters results in background voltage distortion of 10% or more. transformers, and overall system downtime. MTE worked closely with a large energy company to test the Matrix AP Harmonic Filter against a competitor’s filter on several well sites. than 5% total harmonic current distortion THID at 45% load. With the Matrix AP Harmonic Filter, the overall voltage distortion was reduced by as much as 50% compared to the competition. 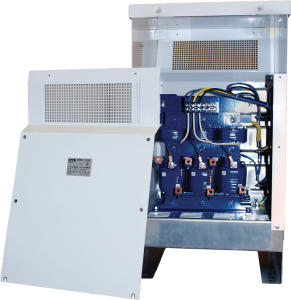 MTE’s Matrix AP Harmonic Filter proved to be the best solution for keeping low level harmonic distortion from accumulating on the power grid. Current distortion was 15% to 30% lower with the Matrix AP Filter. Voltage distortion at the utility transformer was lower as well. MTE’s Matrix AP Harmonic Filter, with its patent pending adaptive passive technology, together with 6-pulse drives, out-performed the competition. The solution ensured that the energy company minimized harmonic distortion to the grid and stayed in production, thus maximizing revenue. 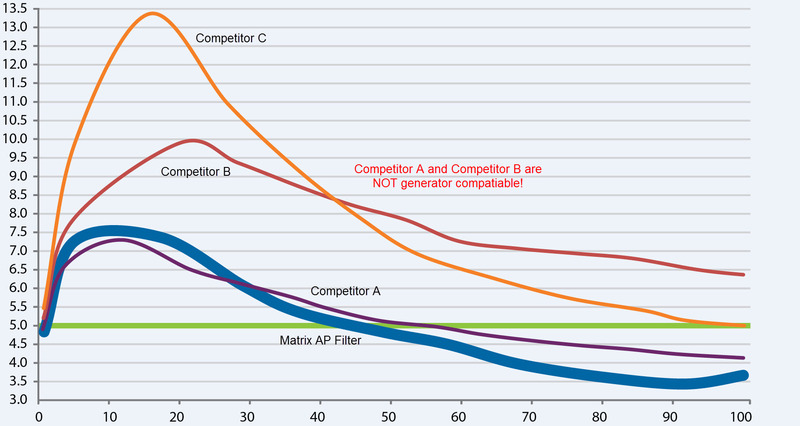 The generator compatible Matrix AP Harmonic Filter has best-in-class performance.